This half day tour was spectacular!! We had a guide, Hamlet, who picked us up from our hotel on time and pick up the next few passengers from their hotel. He explained how we would get on the St. John Ferry and there would be another guide, Kenneth, who would pick us up upon arriving. Kenneth was wonderful and showed us the ruins of an old sugarcane plantation and stopped a few times on the side of the road to let us take pictures and take pictures of us as well. He explained a lot about St. John and it's history and then dropped us off at Trunk Bay were we had over three hours to enjoy the beach and snorkel away. It was such an amazing experience and fun and easy! I highly recommend doing this if you have time! 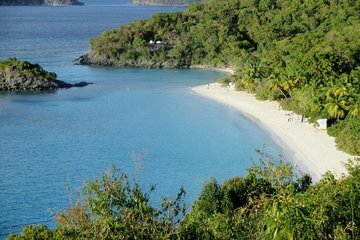 We had an amazing time at Trunk Bay! We were met at the windmill at the cruise port in St. Thomas and were taken to a ferry paid by Viator. Once off the ferry, we were met by Kenneth who took us to Trunk Bay. It was wonderful! Not crowded at all and we thoroughly enjoyed it! We got to spend 2 hours there and were picked up by Kenneth and taken back to the ferry. He pulled over several times for amazing photo ops on the way. Once off the ferry, were were met by Hector who took us back to the cruise port. We were back in time to do some shopping before boarding the ship. The only downside was there was no food/beverage service yet on Trunk Bay because of Irma. But, I would go again in a heartbeat! I missed this tour as I was not aware the island is an hour ahead of ship time. Another tour operator called to ask if I could grab a cab to catch up but the person on the phone was very defensive saying repeatedly it was our fault for no-showing and that they tried to contact us by text. I took full responsibility for the mistake and never once blamed them. I was only trying to catch up. However, the company cannot assume everyone has access to a cell phone especially when traveling. She said it was my responsibility to contact the tour operator ahead of traveling. Which I did, BUT GOT NO REPLY to my email. I guess I should have paid for the international cell call. We ended up jumping on a local Viator tour of St. Thomas. QUEEN MARION saved the day! She gave great tour, took us to the beach at the end and came back promptly at the present arranged time and took us too the ship.